Horse Derby Quest 2016 - Saddle up your horse and race against the best riders in the world!! It’s time for the epic Horse Racing Challenge! Break into a gallop and jump over the hurdles to win the race in this Realistic 3D Horse Racing Simulation. Play for pride, run hard, stay on track, jump cleanly over the verticals and spreads and complete the race within allotted time. Keep an eye on your horses's stamina while you push it for fierce speed. Jump over hurdles and dodge the muddy patches to be first one crossing the winning line. Earn extra cash for every clean jump and use the cash to buy better horses. Upgrade your horse's abilities to win all the races and become the World Champion. - Realistic 3D Horse Racing Track. - Exciting Races And Challenges. - Beautiful 3D Animated Horses. 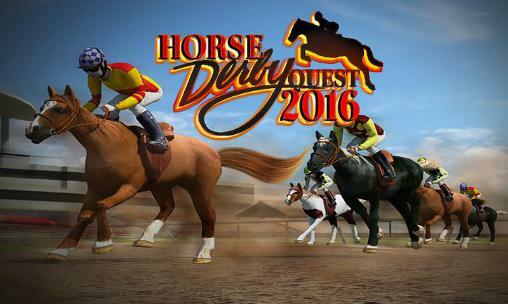 Horse Derby Quest 2016: install APK and play the game.